Watch this quick video I put together of how to make this cranberry raspberry chia lemonade above. Subscribe to my YouTube channel to get notified of new videos. 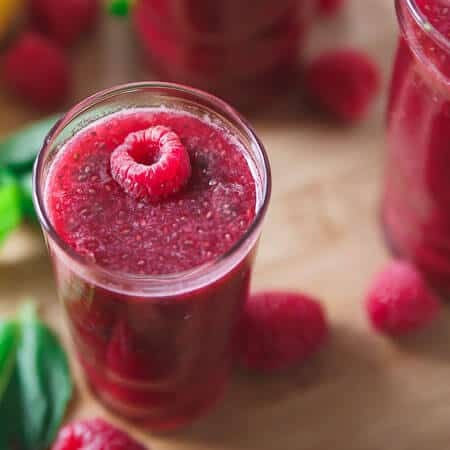 This chia lemonade with cranberry and raspberry is tart, sweet and filled with nutritious chia seeds for a refreshing and healthy drink. Ok, question…are you a chia seed lover or hater? *This post is sponsored by CocoaVia® as part of the #HeartMonth campaign through the Healthy Aperture Blogger Network. Like cilantro though, I’m a lover. Full blown, gimme all the chia seeds and I will put them in e.v.e.r.y.t.h.i.n.g. kind of person. I also happen to love tapioca and their gummy little ball-ness so this really isn’t surprising. So given this obsession, you can imagine my excitement the first time I saw chia lemonade. I had no idea this was a “thing” until I was confronted with it right next to the kombucha I was about to purchase. Game changer! I quickly aborted mission kombucha in favor of the lemonade and with one sip, I was hooked. Tangy lemonade goodness combined with that fun gummy chia texture, it was everything I wanted in a drink. Which is why making my own became a must. ps- check out how to make your own homemade sports drink too! I’ve made chia drinks at home a few times now but I think I’ve really perfected it with this cranberry raspberry chia lemonade. It’s tangy like you want from a lemonade thanks to freshly squeezed lemon juice and fresh cranberries with just enough sweetness from the raspberries and…secret ingredient, a CocoaVia® cran-raspberry powdered stick pack. CocoaVia® is a daily cocoa extract supplement that delivers the highest concentration of cocoa flavanols, which are scientifically proven to promote a healthy heart by supporting healthy blood flow†. 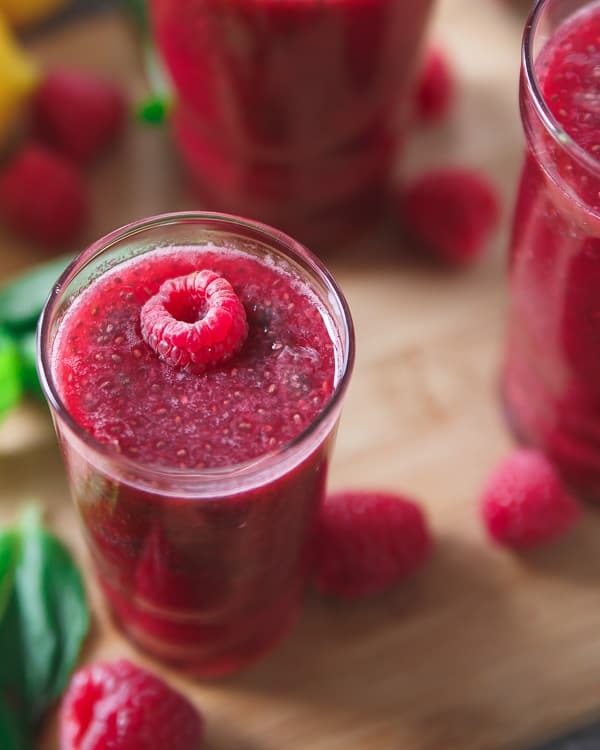 I’ve talked about and used CocoaVia® supplements before in this chocolate cashew butter banana smoothie and this chocolate espresso coconut smoothie but both times I used the chocolate powdered stick packs so I was excited to give this cran-raspberry one a shot in the chia lemonade. Chocolate is a fabulous treat, but it’s not a reliable way to get sufficient quantities of cocoa flavanols. Traditional cocoa processing, which includes drying, fermenting and roasting of beans, destroys many of the flavanols naturally present in the cocoa bean. CocoaVia® supplement isolates the “good stuff” in chocolate in a convenient, versatile form, without all the calories and fat. With 375 mg of cocoa flavanols per serving of CocoaVia® supplement, this chia lemonade is not only a tangy sweet and refreshing drink to sip on, but a healthy one too! 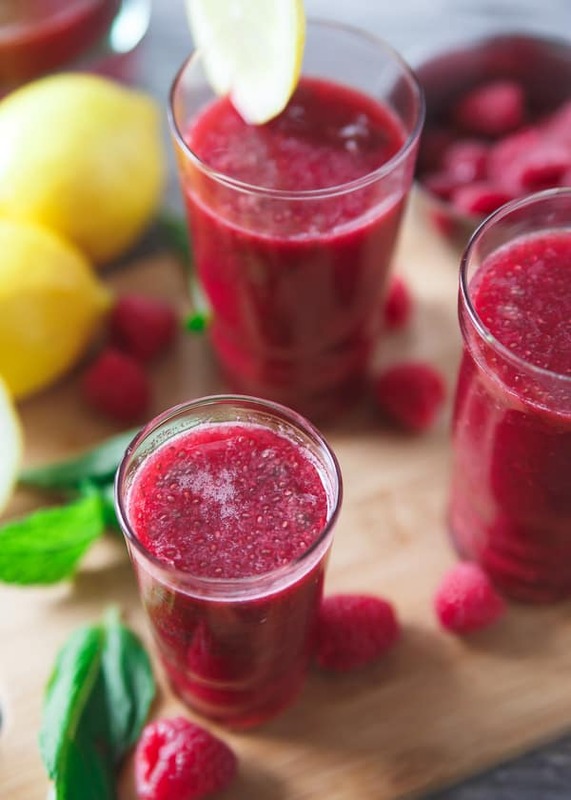 Love this cranberry raspberry chia lemonade recipe? Try other delicious drinks such as Roasted Peach Rosemary Lemonade, Strawberry basil lemonade and Strawberry Basil Cider Slushies. Add 1 cup of water and chia seeds to a glass or small bowl and stir until well combined. Set aside and let thicken for at least 30 minutes. Meanwhile, combine 1/4 cup water with the raspberries and cranberries in a small pot. Simmer over medium heat until broken down and liquid has cooked off, about 10-15 minutes. Transfer mixture to a fine mesh strainer and over a bowl, push fruit mixture through strainer so you extract the juice but not the pulp. Set juice aside. Add juice mixture, lemon juice, remaining 1 cup water, CocoVia, chia seed mixture and optional sweetener to a pitcher. Stir until well combined. Serve or chill then serve. I’m so intrigued by this! The color is beautiful and CocoaVia looks like such a cool product! I just had chias for breakfast. I love them! And I love the idea of making this drink from scratch. I need to give chia seeds another try. My first experience was bad, was not a fan of the things sticking to my teeth. However, between this beautiful lemonade and all the pudding recipes I’m thinking there may still be hope! Love your video too! I am the strange one that is on the fence with chia seeds. I don’t want them in my pudding, but in breads or something like this I think they are good. This is such a great color and the flavors sound amazing together! What a delicious combination and absolutely gorgeous color! This lemonade was so delicious! I love the CocoaVia and the color is ahhhhhmazing! love the video and this cranberry-raspberry-chia-lemonade!!! !